The Master Series 30ft 16,000 GVW simply put, is "the best spray foam rig in the industry". 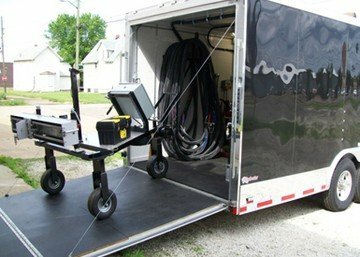 This all aluminum cargo mate trailer is a fully equipped mobile spray foam rig, carrying the Barrel Blazer heating system and the Spraybot, and will fulfill your expectations for any spray foam or coatings project. This mobile spray rig combination is designed to install interior spray foam / spray foam roofing / Polyurea and coatings to manufacturer's specifications at the highest quality and rate of production needed for any size project. Our contractors frequently work on high volume roads, bridges, and commercial roofs in excess of 40,000 square feet. With the capability of up to 410ft of heated spray hose, choose from a 2,000 PSI proportioner or 3,500 PSI classic series spray machine from PMC. 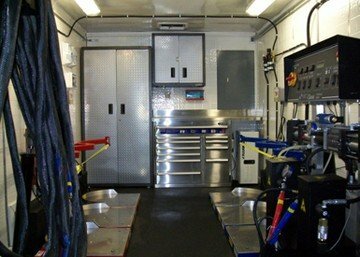 To further enhance this mobile spray foam rig, we added more cabinet space and installed Polyurea flooring to protect your investment for years to come. SprayWorks is dedicated to bringing you the most advanced technology ever featured before in the industry at a price you can afford. A 30ft, 16,000 GVW dream machine that is, simply put, "The best spray foam rig in the industry." The SPF-16ft Series Spray Foam Rig is an excellent way to provide energy reduction solutions for your customers. The SPF-16ft Spray Foam Rig is a self-contained Mobile Plural Component Proportioner Spray Foam Equipment System that is used to manufacture open and closed cell Spray foam insulation to create energy efficient homes and buildings. Whether it is a crawl space, attics, wall studs, or sealing barrier on walls the SPF-16ft Spray Rig will spray on a continuous insulation providing highest R-Value per inch and an air sealing barrier giving you the unique ability to fill the gaps and holes that could be difficult to seal. Featuring the best line of spray foam equipment, the M-16 Spray Foam Rig has everything you will ever want in a turnkey mobile spray foam rig!